New Zealand stargazer John Drummond captured this image of comet Pan-STARRS on Jan. 23, 2013. 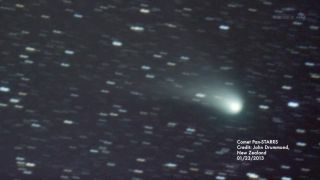 The comet may become visible to the naked eye in March 2013. "However, it could still be difficult to see," Knight added. "From our point of view on Earth, the comet will be very close to the sun. This means that it is only observable in twilight when the sky is not fully dark." The comet comes from the Oort Cloud, a shell of icy bodies thought to surround the outer solar system. Interactions with passing stars, molecular clouds and gravity from the galaxy sometimes sends these distant bodies falling inward toward the sun. Comets from the Oort Cloud are like pristine time capsules from the solar system's early life, packed with virgin icy material that has been untouched by the warmth and light of the sun. Comet Pan-STARRS was discovered in June 2011 by the Panoramic Survey Telescope & Rapid Response System, or Pan-STARRS telescope, in Hawaii, which scans the sky for potentially dangerous asteroids and comets that could pose an impact threat to Earth. The cosmic snowball will make its nearest approach to Earth on March 5, when it will come be about 100 million miles (160 million kilometers) away. On March 10, the comet makes its closest approach to the sun. But astronomers say the best time to look for it might be at sunset March 12 and 13, when the comet will appear not far from the crescent moon. "My guess is that the primary feature visible to the naked eye will be the gaseous coma around the head of the comet," Knight said. "The comet's tail will probably require binoculars or a small telescope." Astronomers are also keeping an eye on another sun-grazing comet that could shine as bright as the moon and may even be visible in broad daylight later this year. If it delivers on its promise, the Comet ISON is expected to peak in late November. "Two bright comets in one year is a rare treat," Karl Battams of the Naval Research Lab said in a statement. "This could be good." Editor's note: If you snap an amazing photo of Comet Pan-STARRS in the night sky, or any other celestial object, and you'd like to share for a possible story or image gallery, please send images and comments, including location information, to managing editor Tariq Malik at spacephotos@space.com.